Book Launch and Review of Parliament Exposed: Malaysian Policies and Challenges by Dato’ Seri Anwar Ibrahim. The first of series of studies by the research think-tank, Political Studies for Change (KPRU) is published. 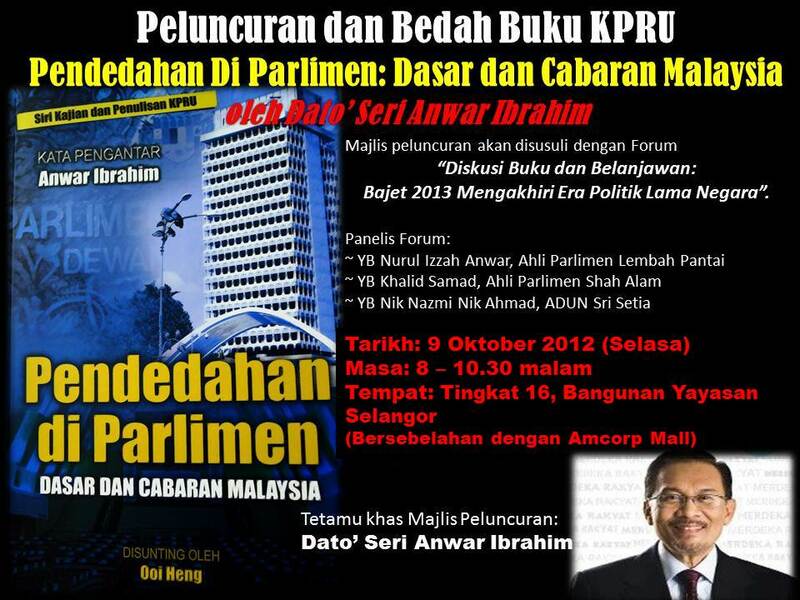 This release of the book Parliament Exposed: Malaysian Policies and Challenges or Pendedahan di Parlimen: Dasar dan Cabaran Malaysia will be officiated by the Leader of the Opposition, Dato’ Seri Anwar Ibrahim on the 9th October 2012 at Bangunan Yayasan Selangor. The launching of the book edited by Executive Director of KPRU, Ooi Heng, is organized by the Anwar Ibrahim Club (AIC), Strategic Information and Research Development Centre (SIRD) and KPRU itself with the cooperation with Pak Sako Academy (Akademi Pak Sako) dan the Alumni of the Political Schools (Alumni Sekolah Politik). The launching ceremony will be followed by a Forum “Book and Budget Discussion: 2013 Budget The End of the Old Politics Era in Malaysia”. The book is the joint publication of KPRU and SIRD.